The Federal National Council is considered a UAE federal authority along with the office of the President, the Supreme Council of Rulers of the seven emirates, the Council of Ministers (the Cabinet), and the judiciary. Its mandate is to represent the UAE people. 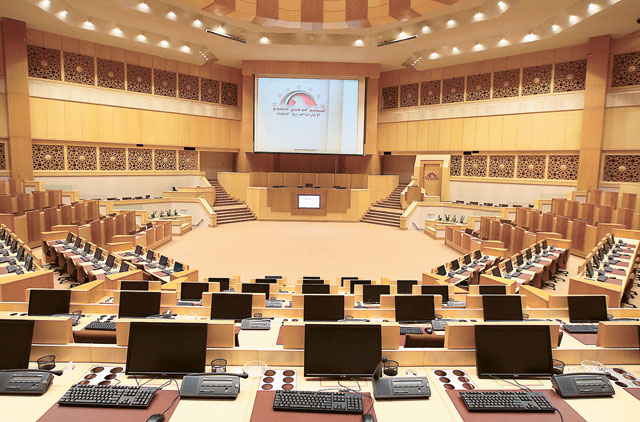 In a traditional three-tier model of states (executive, judiciary and legislature), if the Supreme Council, the Council of Ministers and the office of the president were considered the executive branches of government, the FNC would be considered the legislative branch. The divisions in the UAE, however, are not as clear, as most legislative powers lie with the executive branch. How democratic is the FNC? Elections were introduced to the FNC in 2006, where half the members were to be elected by a select group of citizens that formed an electoral college. Before then, all members of the FNC were picked by the Rulers of the emirates. In 2006, the Electoral College, members of which can run and vote, comprised less than one per cent of the UAE's citizen population. In the 2011 elections however, the college was expanded to 129,274 members, approximately 13 per cent of the UAE's citizen population, of which many have yet to reach voting age. The government has repeatedly stressed that both milestones, of 2006 and 2011, were initial steps towards a more representative political system. It is believed that universal suffrage will be introduced in the future. Who can vote and who can run? Currently, only members of the Electoral College can run or vote. The college, picked by the Rulers of the seven emirates, is a collection of UAE citizens who can participate in the election process. While all EC members can vote, those who wish to run have to meet the main condition of age. Candidates must be over 25 years. For the 2011 elections, that automatically excludes 18,728 members of the Electoral College, or 14.5 per cent of it. The seven emirates are the constituencies, and a voter from one emirate cannot elect a candidate from another. Each candidate may vote for a maximum number of candidates that corresponds with the number of elected seats his or her emirate is allotted. For example, a voter from Sharjah can only vote for three candidates, all of whom have to be running in Sharjah. Aside from being over 25 years old, a candidate must also have a good conduct certificate and be literate. Each term is for four years.